Slow file reads on Win/Ruby 1.9: Use 'rb' mode (and maybe 1.9.2) to slurp big files quickly. I'm forced to use Ruby on Windows at work. (I love Ruby. I'm not a big fan of Windows.) Recently I was processing large (150MB) log files. Each is a text file with reasonable line lengths (300-500 characters per line). In the process, I found out that File.open is very slow for large files on Windows unless you read it as a binary file. 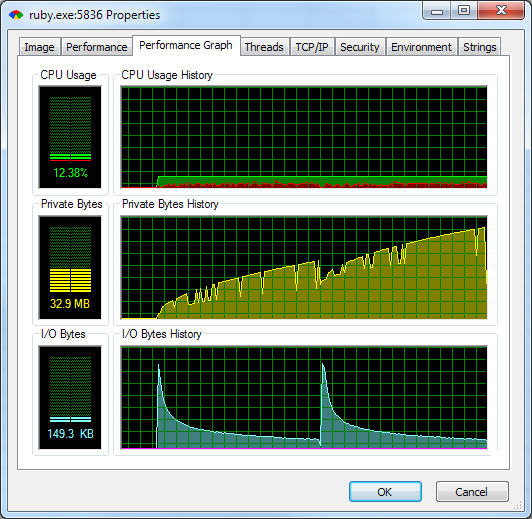 The graphs above are the result of watching the middle test on an 80k file using Process Explorer. (To ensure that the file is in the disk cache, the same process is run twice; see below.) It's particularly surprising that a) memory appears to be being garbage collected in the middle of the file slurp, and b) much of the memory allocated by the first slurp isn't released as the second one starts. Although not shown in these tests, disabling garbage collection does not improve this problem noticeably. Lesson: Don't try to slurp a really large file on Windows using File.open in text mode. At 150MB, I let my script run for almost half an hour on the first file before giving up and killing the process. The tests were run on a 2.8GHz Intel i7 860 with 8GB of RAM and a 10kRPM hard drive. The machine was under no load and had plenty of RAM available. All tests max out the CPU on one of eight cores while running. The worst-performing test consumed only 30.4MB at its peak. Upgrading to Ruby 1.9.2 on that machine fixed this problem.